Starting with 2x6 or bigger 10' Cedar and Paulowina, whatever looks great at our lumber supplier, cutting, shaping, gluing, shaping again, glassing and sweating out details we build handcrafted Hollow Wooden Surfboards. 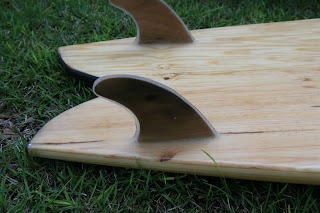 There are many different techniques for construction, some very simple others rather complicated, WoodyLogic had exactly what we were looking for in templet designs, board shapes, and use of woods. All our woods are either from sustainable managed forests or pieces we have harvested (mostly trim pieces). 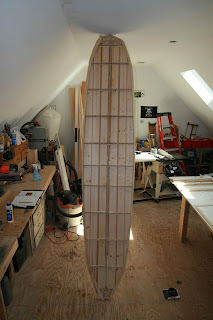 Building wooden surfboards is not for faint of heart. Sure, looks easy but with every cut and every bit of making certain every piece is exactly as needed, well that takes time. In all we have about 90 hours in each board. Bending, twisting, begging wood to behave is an art. Dan Johnston has built furniture from woods cut out of friend's yards and milled at home. His wicked 32" Husky chain saw is more motorcycle than saw. Some of the trim woods Blind Dog uses are from his stock pile of oak, walnut, maple and other interesting woods. 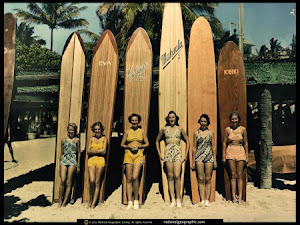 "I started surfing in California around 1962, grew up in Torrance and Hermosa Beach. Life was easy back then. 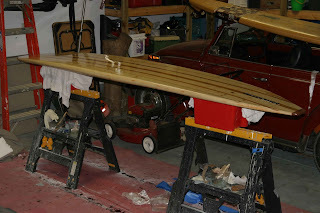 We loaded up our old Ford, would drive to San Deigo on Friday night, surf at Cardif or head up to Santa Barbara to surf Hammond's Reef if SD was flat. No internet in those days, surf hunting was a crap shoot. He lived in Hawaii for short time, thanks to Uncle Sam and US Navy. "Surfed Sunset Beach with some mainland friends, must have been 10' out there. No leashes and nasty swims. "I learned my limit that day." 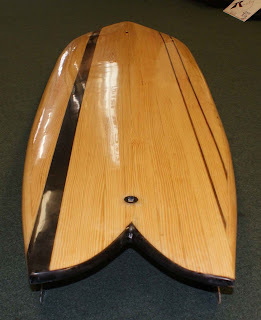 At age 17 he made his first board, glassed it in a friend's living room when his parents were skiing. Didn't go over well when they got home. 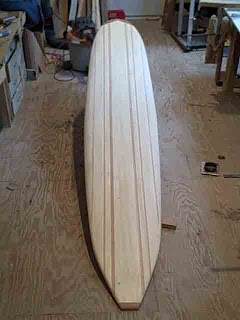 Used to by blanks from Bing Surfboards. They were the only shop that would sell to dumb kids. He raised two great children, lived where surfing was impossible and took it back up after 40 years of desk work. My boards are hollow. Crafted like an airplane wing each is extremely strong and light. We only use epoxy and S-glass. Typically 4 oz since it has the strength of 6 oz regular glass. Nice part about S-glass is how it lays and bends around rails easy to work with, light and strong. Wood. Fin is an FCS 8 1/5” Ezi-Trim. This board is great for nose riding, and is a rocket when blasting through sections. 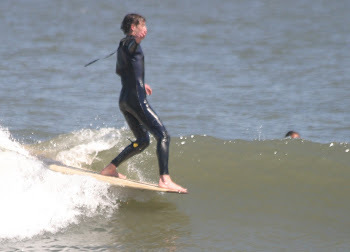 The flat bottom is for speed and the rails are 80/20 to grip into waves. Much like an airplane wing the idea is strength without weight. Rib and decking construction is akin to "I" beam mechanics – stress distribution across a wide area. 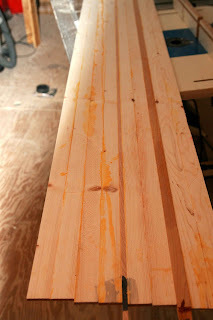 This board is Spruce and Cedar decking. Spruce is a light wood with nice figuring, good for book matching panels. About 20% of panel decking cut is not usable – loose knots, warped, or just damn ugly. 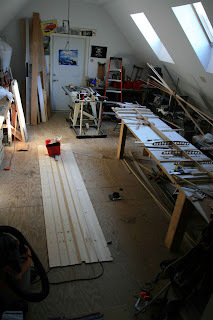 First task is to rip ¼" x 1 ½" strips from 2" x 6" and 2" x8" 10 foot boards. Not one of my fun jobs. Here's what the bottom deck on this board looked like after gluing ½ of the 27" wide deck: This was then run through a panel sander to bring down to 3/16". 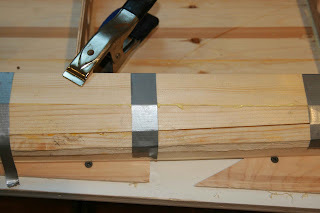 Then two sections glued together. Notice that black paint; it was a test to see if I could ebonize the red oak stringer. I use vinegar saturated with iron to stain oak furniture. I didn't like the effect. Ok, so here's where it all goes together. On the floor is a completed bottom deck. Middle photo is just bringing together decking for one side. While this looks distorted, it's rather symmetrical. 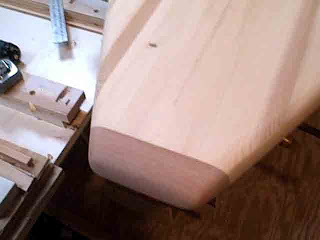 Below, need to make perfect 90 degree rib/spar gluing. On right is gluing rip/spar to bottom decking. Needed lots of weigh to keep it flat and not twist. Probably 200 pounds distributed on that center spar and ribs. 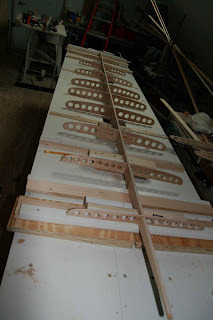 Right photo, tail being enclosed, between spar is blocking for fin box. Rail 1, 2, and 3 in place. 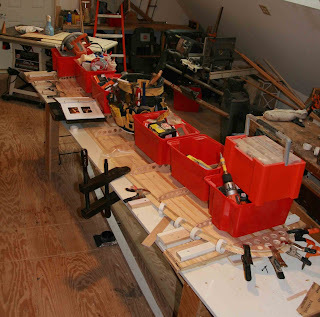 Clamps at this point are worthless except for rail to rib placement. Tape works much better. Without nose and tail work. Not even shaped but still looks good. Nose is Black Walnut, tail is Australian Lace Wood. 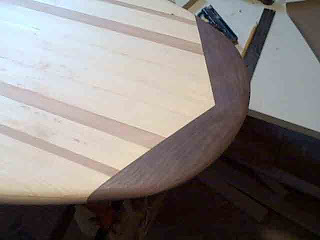 Hand planed/shaped. Very few power shaping tools allowed, handed and ready for glassing. 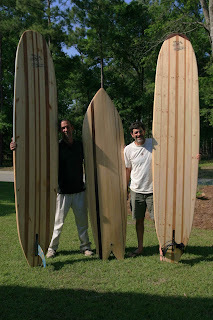 I used 4 oz S-2 epoxy rated fiberglass and two-part epoxy from the Green Room in Wilmington, NC. Great stuff to work with, sets up quickly so timing is everything but no smell like regular resin. 4 oz is equal to 6 oz regular glass and is very transparent. With foam boards the weave blends into the white foam, here on wood, we try to find the most transparent glass with highest strength to weight ratio that gives us a light, tough finish. 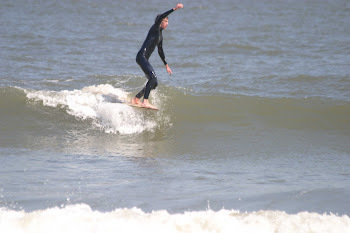 May 2, 2009 Wrightsville Beach, NC. 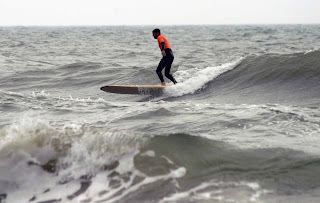 Longboard competition. I took 3 in Legends group with this board. I only wished all the waves were as good as this one. 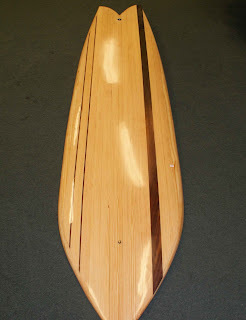 Your board has been hand crafted to give you a surfing experience that very few will know. Each piece of wood has been selected for uniqueness of grain pattern and weight. 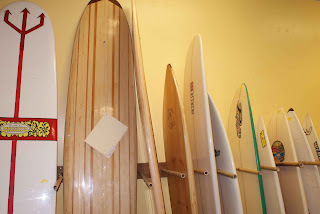 We use Green Room Surf Shops (Wilmington, NC) surfboard formulated epoxy. 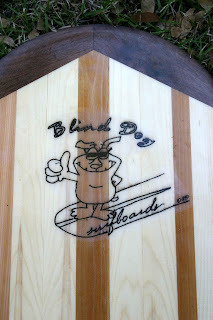 Water white clear with UV protection chemistry, we have used their epoxy since our first board. This is not a foam pop-out CNC mass produced board. It represents about 100 hours of skilled wood working and glassing. Very few power tools are used, mainly because hand tools provide better control and heck it's just a nice quite experience. 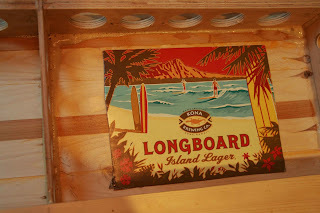 Like fine furniture, there are tips to keeping your board in good shape. NEVER leave the vent plug closed with transporting, storing, sitting on the beach. It must be left open at all times except surfing. Too much air pressure build up will pop joints. If you lose the vent plug, give me a call. Vent plug, threaded screw should be blown clean of sand before you seal the vent. Might get a few o-rings from Lowes or Home Depot and replace it every so often. Always snug tight the vent plug when heading out. If it’s really hot outside, you probably need to equalize the inside temp between outside air and water temp. Close the vent then dunk the board for a minute then open the vent. You will probably her a rush of air into your board. Hot air when cooled (in this case by the ocean water, contracts), just a something to think about. Try to avoid prolonged exposure to sun. Like any board, and to us humans, sun is nice to get warmed by but not good in big doses. If you want to keep the luster, use automotive polish/cleaner. Polishing compounds will work and give a nice shine but some are more course than others. Electric buffer can be used, just do not apply heavy pressure, buff lightly. Epoxy is extremely strong and much more resilient than polyester resin. If you ding it, more than likely it will just be a crack and should not go through to the wood. Just keep an eye on it, if it looks like or you are concerned about it, email me and let's talk. 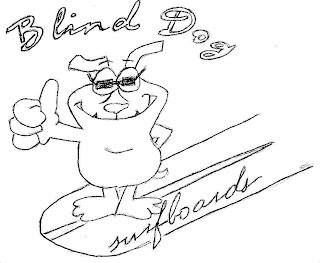 Blind Dog is for real. 'Spanky' to his family, he is the sweetest pooch you'd ever want to meet. To him, the world is full of life, sounds, smells, and touch. He's a mutt but are we all too some degree.